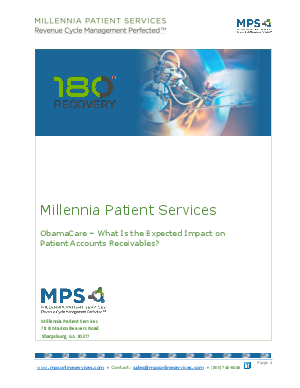 > Research Library > Millennia Patient Service > ObamaCare – What Is the Expected Impact on Patient Accounts Receivables? PPACA is now the law of the land for those of us in the medical and medical support service fields. Rather than burying our heads in the sand, it is critical that we understand and prepare for the direct and indirect effects the PPACA will have on the medical provider revenue cycle. Below are a three key points and statistics that you will need to understand and manage the impact on patient A/R.